Be the first to share your favorite memory, photo or story of Frieda. This memorial page is dedicated for family, friends and future generations to celebrate the life of their loved one. Frieda Rose Haas, 91, Nauvoo passed away Saturday, February 17, 2018, at 11:41 a.m., in her home surrounded by her family. She was born in Sonora Township on February 19, 1926, the daughter of Gabriel and Ellen Moffitt Wilkens. She married Roy Edward Haas on June 1, 1946 in Nauvoo. He preceded her in death on October 22, 1985. She is survived by children, Edward Lee (Rebecca) Haas, Nauvoo; Deborah Jones, Springfield IL; Paul Haas, Nauvoo; Diane (Jeff) Shoen, Moweaqua, IL; and Kevin (Laura) Haas, Hudson, IL; grandchildren Jonathan Haas, Riverview, FL, Kenny (Kayla) Haas, Nauvoo, Marianne (Brett) Pence, Prairie City, IL; Dr. Brett, and spouse (Dr. Sabina Modelska) Jones, Springfield IL; Kristy (Geoff) Wellman, Burlington, IA, Laura (Brandan) Beach, Dallas City, IL, Larry (Ashley Thomas) Haas, Fort Madison, IA, Danny (Katie Milligan) Haas, Keokuk, IA; Dr. Abigail (Brian) Barnes, Assumption, IL, Hannah (Austin) Donoho, Moweaqua, IL; Matthew (Jenny) Haas, Mt. Pleasant, SC, Aaron (Rachel) Haas, Mattawan, MI; many great-grandchildren and was looking forward to the addition of 2 more in the near future, also surviving are sisters, Mary Delaney, Keokuk IA, Margie Blindt, Burlington, IA, and sister-in-law, Ann Wilkens, Nauvoo. She was preceded in death by her parents, sisters Virginia Benjamin, Ruth Grunewald; brother William Wilkens, and her beloved son, Larry, at age 2 years. She was a proud farmer’s wife, mother and grandmother. She loved gardening, cooking, baking, reading, and spending time with her family and friends. Frieda enjoyed researching and writing about family history. She was an avid card player and was a member of her Pitch card club for over 35 years. She loved playing games with her family, friends and grandchildren. Upon her graduation from Sts. Peter & Paul High School, Frieda worked at Sheaffer Pen Co. and later she worked as a substitute rural mail carrier. She enjoyed volunteering at Nauvoo Tourist Center, Sts. Peter & Paul Sunday pre-school program, Sts. Peter & Paul and Nauvoo Grade Schools. 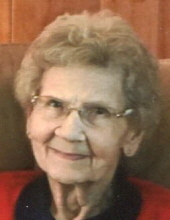 She was a member of the St. Peter & Paul Catholic Church and the Catholic Women’s Club. Frieda and Ed enjoyed many years of Square Dancing together. Visitation will be Tuesday, February 20, 2018 at Saints Peter & Paul Catholic Church in Nauvoo where the family will receive friends from 4:00 to 7:00 p.m. with a Rosary at 6:30 p,m. A Mass of Christian Burial will be Wednesday, February 21, 2018 at 10:00 a.m. at Sts. Peter & Paul Catholic Church with Father Tony Trosley as Celebrant. Burial will be in the Sts. Peter & Paul Cemetery, Nauvoo. A memorial fund has been established for Sts. Peter & Paul School. To plant a tree in memory of Frieda Rose Haas, please visit our Tribute Store. "Email Address" would like to share the life celebration of Frieda Rose Haas. Click on the "link" to go to share a favorite memory or leave a condolence message for the family.